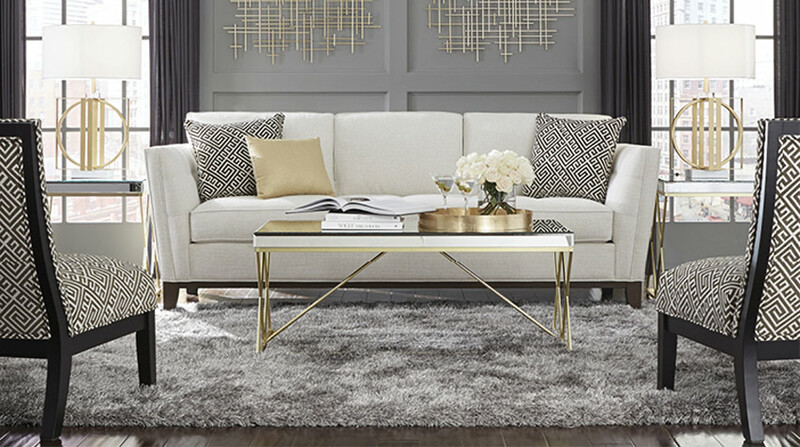 Some people love the polished cohesiveness of a pre-planned matching living room set package bought in the store. The pieces are already in coordinating styles and appropriate scale to work well together. By seeing the pieces placed together in photos or the furniture showroom, you can more easily picture them together in your home. However, others find that matching living room sets lack depth and dimension. These folks find that pulling together and coordinating individual pieces results in a living room with more interest and complexity. Starting from Scratch or Refreshing your Room? First, if you are buying all new furniture, you could go either way – you could buy a set to fit, or select individual pieces to fill your room. When you already have pieces of furniture that you want to keep and are trying to replace a few or add to what you have, don’t be afraid to mix in something new. Spend some time searching designer rooms online, you’ll see that they typically mix pieces to add diversity and interest to a room. However it takes some work, and an eye toward detail. You’ll need to pay attention to things like table height and chair height and depth. While different shapes can go together, you’ll want to avoid completely different scale of items. Because it’s an investment that you will want to enjoy for years to come, shopping for furniture can take time. Finding pieces that both suit your style and feel comfortable to you can be a challenge. If this is a challenge you enjoy, if you love the search, if you like different and varied styles and if you have the time to devote to it; then mixing pieces to create a custom living room will work for you. If you don’t have the time to dedicate to the search and find it challenging to picture different pieces together, then a matching set would be a better fit. Often when buying a living room set, stores will offer discounted price for the package. So this could provide you a better pricing that purchasing pieces individually. However if you aren’t looking for a complete set, only a few pieces; then holding on to the pieces you have and adding just a few will save you money over purchasing a complete set. So you’ve decided you don’t want a matchy-matchy living room set, you prefer the look that professional designers frequently use - pulling together different and unique furniture pieces to create a fabulously decorated room. This technique can be used to create rooms as varied as eclectic modern, shabby chic and comfy cottage style. Spend time searching for examples of designer living rooms to get ideas. While it can be more work than buying a pre-styled matching living room sets, don’t get intimidated by the idea. By keeping a few tips and techniques in mind, you can create a beautiful and interesting custom room that you will LOVE spending time in. Consistent scale – First look at the size, shape and scale of the seating pieces. Different styles in furniture can work well together in the same room, but the scale need to be similar. Look at seat height, seat depth and back height; all need to be similar scale for a cohesive look. Similarly, consider volume -- you don’t want to pair an oversized or overstuffed armchair with a petite dainty settee. Tables don’t have to match but should be similar heights. Create balance – Similar to scale, balance speaks to concepts like making sure that two different tables have similar visual weighting. Look at things like the thickness of the legs of chairs, legs of tables, and height of the legs on a sofa; all factors that help you gauge the visual weight of a piece of furniture. Look at shape and tone – It is tough to successfully pair markedly different shapes – like a spare boxy sofa with cushy rolled armed chair, so stick with similar shapes for your upholstered pieces. Additionally, keep your choices in the same range of formality – don’t mix an informal unfinished wood chest with a French provincial sofa. Mix thoroughly – If you are mixing two different styles, make sure they are integrated throughout the room. You wouldn’t want a room that is one side country-cottage and the other side transitional – the stark contrast would be alarming. However these elements when integrated thoroughly in the room can be eclectic and interesting. Pair a few things – Especially with chairs, it helps to have a matching pair or very similar partnering. This will add some cohesiveness to your room. Color theme and use it to bring disparate elements together – Picking a color theme can bring disparate elements together. An example for instance is pairing a patterned couch with a solid chair that picks up on one of the colors in the sofa. Another would be a room that repeats a same bold color throughout, even if it is slightly different shades of the same color. This could be a color on the upholstered furniture pieces, or repeated on the accents around the room utilizing throw pillows, area rug, lampshade, etc. Common fabric pattern on multiple pieces – If you are adding to some of your existing upholstered pieces, reupholstering in the same fabric as the new pieces you are picking up will add continuity. Or even just bringing consistency across pieces with coordinated throw pillows can tie a room together. What do you do if you are starting with a matching living room set that you don’t want to waste? Simply split the set apart to use in different rooms, and then use the tips above to finish the room creating a custom look.